The Reunification of Jerusalem refers to the June 1967 administrative merger of West Jerusalem and East Jerusalem by Israel, following the conquest of the Eastern half of the city (including the walled Old City) from Jordan during the Six Day War. In 1980, the merger of West and East Jerusalem was legalized in Israel by the Jerusalem Law, though this move was rejected by the UN and most of the international community. The Reunification is celebrated as an Israeli national holiday, Jerusalem Day; The celebrations of the 50th anniversary was commemorated in 2017. Jordan and an alliance of Arab states rejected the 1947 UN Partition Plan under which Jerusalem was to be a corpus separatum, instead invading former Palestinian Mandate territory, and by the armistice in 1949 was in control of the Old City and East Jerusalem. The Arab invading armies failed to take control over the rest of Israel, including West Jerusalem. The city was divided along the 1949 Armistice Line until Jordan chose to join a coalition of Arab states and invade Israel in the 1967 Six-Day War. As part of the Jordanian campaign, June 5, 1967, the Jordanian Army began shelling Israel. When the Israeli cabinet convened to decide how to respond, Yigal Allon and Menahem Begin argued that this was an opportunity to take the Old City of Jerusalem, but Eshkol decided to defer any decision until Moshe Dayan and Yitzhak Rabin could be consulted. During the late afternoon of June 5, the Israelis launched an offensive to encircle Jerusalem, which lasted into the following day. On June 7, heavy fighting ensued. 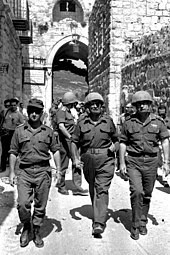 Dayan had ordered his troops not to enter the Old City; however, upon hearing that the UN was about to declare a ceasefire, he changed his mind, and without cabinet clearance, decided to capture it. Israeli victory resulted in the city's reunification. 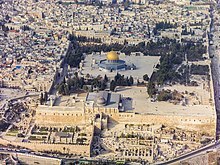 [better source needed] On 30 July 1980, the Knesset officially approved the Jerusalem Law, which called the city the complete and united capital. The reunification is celebrated by the annual Jerusalem Day, and Israeli national holiday. However, special celebrations are planned in 2017 to mark the Jubilee of the 1967 reunification. Under Jordanian rule no Jews were permitted to live in the city, which was governed as part of the Jordanian rule West Bank, and the Christian population plummeted, falling from 25,000 to 9,000. Reunification ended the programmatic Islamization of Jerusalem by the government of Jordan, a policy that had included the destruction of dozens of synagogues; the imposition of Arabic-language, government-issued textbooks in Christian schools; a ban on the purchase of property by churches; a ban on church funding of social and medical services, including hospitals; and a complete ban on visits to Jewish holy places by Jewish pilgrims. Freedom of worship by members of all faiths was restored immediately following reunification. The narrow, approximately 120 square metres (1,300 sq ft) pre-1948 alley along the wall used informally for Jewish prayer was enlarged to 2,400 square metres (26,000 sq ft), with the entire Western Wall Plaza covering 20,000 square metres (4.9 acres). In later years, synagogues demolished during the Jordanian rule, including the Hurva Synagogue were rebuilt. Under the direction of Nahman Avigad, the city's Jewish Quarter, which had largely lain in rubble, was carefully excavated before being rebuilt. The complete rebuilding of the city's historic Jewish Quarter offered a virtually blank slate for city planners. ^ "13 Law and Administration Ordinance -Amendment No". Mfa.gov.il. ^ "PM announces extra NIS 850 million for Jerusalem". Times of Israel. JTA. 2 June 2016. Retrieved 9 February 2017. ^ Kollek, Teddy. "Jerusalem: Present and Future." Foreign Affairs 59, no. 5 (1981): 1041-049. doi:10.2307/20040902. ^ Ricca, Simone (Summer 2005). "Heritage, Nationalism and the Shifting Symbolism of the Wailing Wall; June 1967: Erasing The Past". Institute of Jerusalem (Palestine) Studies. ^ Meyers, Eric M. "Nahman Avigad (1905-1992)." Proceedings of the American Academy for Jewish Research 58 (1992): 1-5. https://www.jstor.org/stable/3622620. ^ Azaryahu, Maoz, and Arnon Golan. "Photography, Memory and Ethnic Cleansing: The Fate of the Jewish Quarter of Jerusalem, 1948—John Phillips' Pictorial Record." Israel Studies 17, no. 2 (2012): 62-76. doi:10.2979/israelstudies.17.2.62. ^ Efrat, Elisha, and Allen G. Noble. "Planning Jerusalem." Geographical Review 78, no. 4 (1988): 387-404. doi:10.2307/215090. ^ Kailani, Wasfi. Middle Eastern Studies 44, no. 4 (2008): 633-37. https://www.jstor.org/stable/40262599.